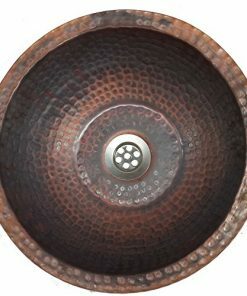 This sink tapers from top to bottom by 3/4”. 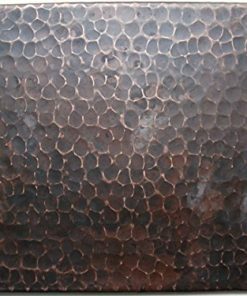 Bottom Width: 22” Top Width 23 1/2”. Dimensions may vary by 1/8”. 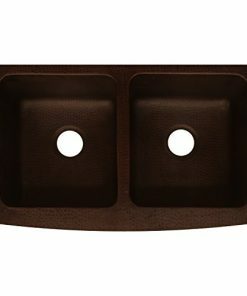 For your countertop cut out template we recommend that you have the actual sink on location for tracing. 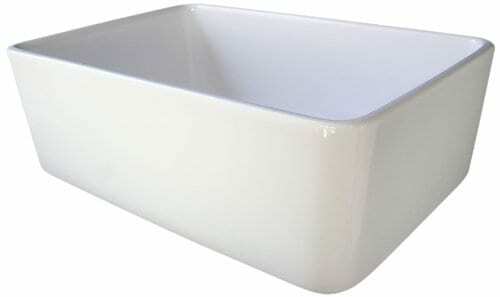 Apron sinks renders an inviting appeal to any kitchen. 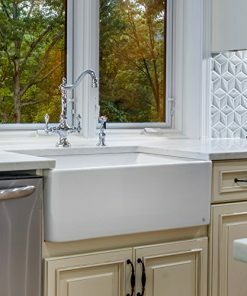 The Alfi brand farmhouse apron kitchen sinks were designed to provide you with a glance of the traditional look of apron farm sinks way back, but with the added twist of up to date style. 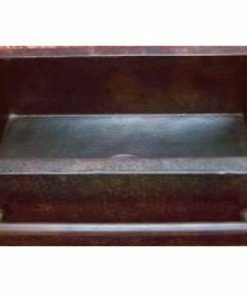 This kitchen sink is made to last with its durability to stains, scratches, and thermal shock. 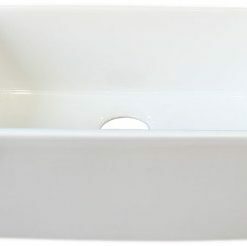 This sink can also be installed in 3 different ways, all of which feature an exposed front apron. 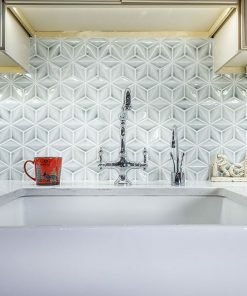 The commonest is Undermount, where the countertop flows over the edge of the sink. 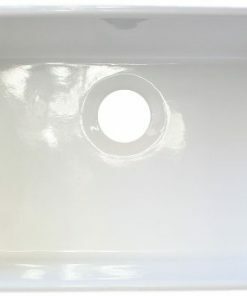 Another option is Flushmount where the countertop and top edge of sink are exactly the same height, in this case the silicone sealer between the sink and countertop will be visible. 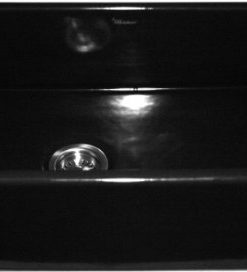 The third option is Topmount where the countertop buts up against the side of the sink which sticks up above the height of the countertop. Not to be puzzled with drop-in which this sink is not designed for. 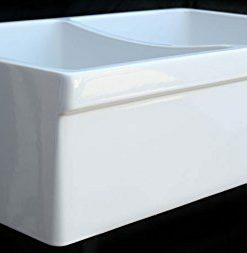 This sink is constructed of solid high-grade fireclay material the usage of high pressure casting, ensuring durability, longevity, and resilience to acids, alkali’s, scratches, and chipping. 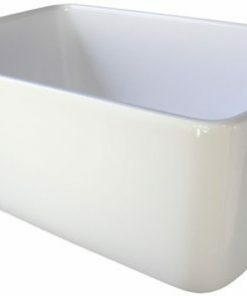 ALFI brand fireclay farm sinks are a throwback to a simpler time. 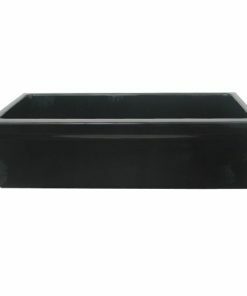 Designed to offer the traditional popular look of an apron farm sink with a up to date twist. 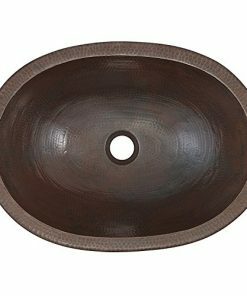 Made of the best quality solid fireclay to insure it not only looks great but also lasts for a long time. 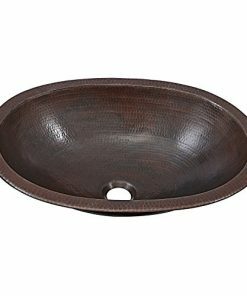 Heat resistant up to 350′ F. This sink has been tested and will not crack because of heat exposure from a pot/pan up to 350′ F hot. 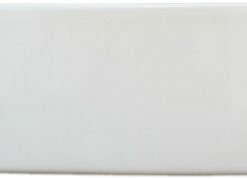 3 1/2″ Rear Center drain. 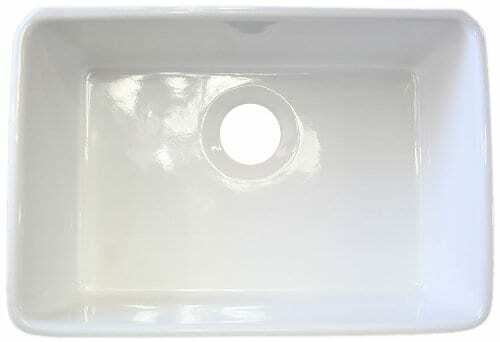 This fireclay sink is compatible to be used with a garbage disposal.